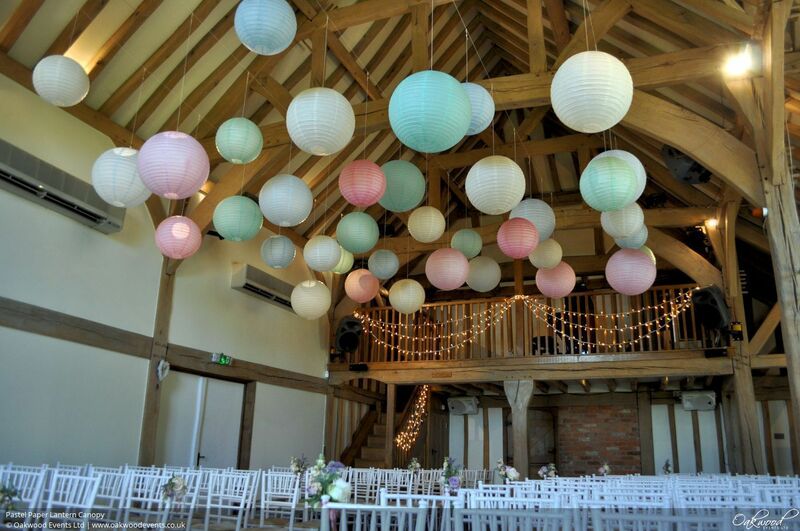 A large canopy of paper lanterns in pastel colours installed above the aisle for a wedding at Cain Manor. The lanterns looked amazing and worked perfectly with the colours in the gorgeous flower arrangements. Visit our main paper lanterns page for more inspiration, or contact us to discuss hiring a lantern display for your wedding. 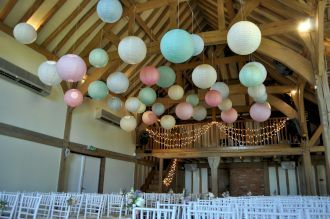 I just wanted to send you a quick email to say thank-you so much for the lighting that you arranged for my wedding at Ufton Court on Saturday 11th April. It was absolutely beautiful and completely transformed the barn and we couldn't have been more pleased with how it looked. It was absolutely perfect!! I have had so many compliments from my guests and will definitely be recommending you in the future.